Walmart Inc has opened its first small high-tech supermarket in China, where smartphones can be used to pay for items that are mostly available on the U.S. retailer’s store on online platform. The world’s largest retailer, known for its hypermarkets, is expanding in China as shopping with mobile devices gains popularity in the country, and as retailers and technology companies such as Alibaba Group Holding Ltd and Tencent Holdings Ltd cut deals to integrate online and offline shopping. Walmart is also targeting more online shoppers, who spend twice as much in the United States when buying on its website. Walmart had run smaller Walmart Express stores in the United States, with 12,000 to 15,000 square feet, compared with about 105,000 square feet for its typical supermarket. But the concept did not take off and the retailer was forced to shut them down in 2016. 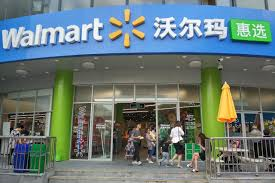 Walmart did not specify the size of the China store, in the southern city of Shenzhen. The company did not immediately respond to a request for comment. The outlet will stock more than 8,000 items ranging from stir-fried clams to fresh fruit, 90 percent of which will be available online, it said in a statement. Items can be delivered within a 2 kilometer (1.2 mile) radius as quickly as 29 minutes, said Walmart, which owns a stake in JD.com. Customers can opt to pay with their smartphone using a program on Tencent Holding Ltd’s WeChat messaging. In March, Walmart said it would expand its grocery home deliveries in key markets to reach more than 40 percent of U.S. households, or 100 metro areas from six currently.